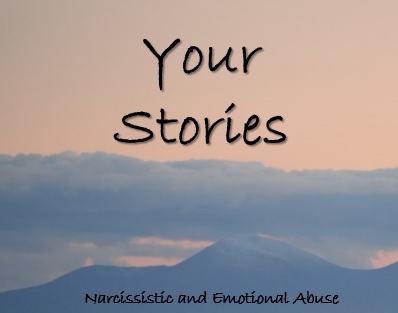 My narc was not an ex-partner or a parent. She was my “gaurdian”. She was so talented in her manipulative abilities, she caused my biological mother to lose legal rights to me and my 3 siblings while we were between the ages of 10 and 15. In order to provide context, I need to give the back story, I’ll keep as breif as possible but it is a long one. Essentially my mum was the family black sheep, the scapegoat throughtout her entire childhood. When speaking out against childhood abuse, she was ostracized from her family. The narc (my mum’s sister) used this opportunity to frame her as a liar. After a failed suicide attempt, my mum moved away from her family and in her early 20’s, (unfortunately) met my dad. He kidnapped, raped and beat her for 5 years. He physically abused my siblings and I, and sexually abused one of my siblings. A local church was concered about our family’s wellbeing and undertook a recuse mission to save us from my dad. We then moved interstate, back to my mums biological family. Despite my mum having been through hoffic truama, they already had a preconceived (albeit false) idea of my mum being a liar and crying wolf about abuse. However, the evidence of us children being abused was indisputable (hense investiagtion reports to back it up). So they basically just expected my traumatized and abuse surviving mother to take on the role of a full time working, single mum of 4 broken children. Once she began fulfilling this role, it’s like everyone just forgot (extreme denial), about the unimaginable abuse my mum suffered and expected life to just go on as normal. After giving her absolute best efforts for 15 years, my mum reached a breaking point. She had a nervous break down. Not only had her previous (childhood and marital) abuse caught up with her, but her narc sister had succesfully isolated her from any form of support. Jumping on this opportunity, my covert narcisisstic aunty fought for legal gaurdianship of one of my siblings and me. After a year long battle in the family court system, she won. She had everyone fooled. Suddenly she had the perfect narrative set; her as a saviour of my sister and me. She spun this story so convincingly that to this day, our mutual church community believes her to be the good guy. There is nothing quite as dangerous as a religious, covert narcissist who is so far gone yet so tactial, she may never be truly found out. Her becoming my gaurdian was life-altering. At the time, she spun the story that my mum had ‘abandoned’ me. I felt like I had just found out my whole life was a lie. How’s this for extreme projection? She framed my mum as having narcsisstic personality disorder. This is how I first came to discover NPD. I was so oblivious, I believed her. She turned everybody against my mum, including her own children and also my mum and aunties parents. The last few years were a rollercoaster for me. I’ve been in ongoing therapy for depression, anxiety and complex PTSD. I met my now husband and moved out from her care. I also have my own child. The pleathera of extensive damage to my emotional and mental wellbeing from early childhood abuse, made me the perfect victim for her gaslighting. She had me and many around her, believing that I was deadset crazy. 1. Completing my senior year at high school as one of the highest achieving students in the state, despite my battle with mental illness. She was clearly jealous (she didn’t finish school), so she emotionally abused me to the point that I believed that I was stupid and lazy (regarless of undeniable acheivements to the contrary). She completely downplayed my success. 2. Attempting to move out of home once I was 18. She succesfully manipulated the person whose house I needed to move into, so it took 5 months of relentlessly trying to leave before I could. That didn’t stop her over-bearing need for control though. She would check that I was paying rent etc. (Despite the fact she lived with this person rent free for a decade). 3. Planning a wedding with her as my mother figure. She was obviously extremely insecure about her role in my life and was therefore very jealous of my true biological mum and my mother in law to be. Planning my wedding was hell. She ruined so much of it. Thankfully my husband and I place more importance on the marriage, rather than the day itself (we still managed to enjoy our day). So after years of events and life-milestones that she destoryed, the breaking point? Me having a child. I could feel the dynamics changing throughout my pregnancy. She was going to be playing a grandparent role and I was nervous of her over bearing and controlling nature. My mother bear hormones were on guard and I started to set boundaires. She noticed the power shift instanaentlousy. I needed to protect my daughter. At this stage I didn’t know she was a narc. Unfortunately, my labour had emergmecy complications and my baby girl ended up in the neonatal intensive care unit, intubated as she couldn’t even breathe on her own. This obviously (and dare I say, reasonably), delayed people being able to meet my daughter. This clearly didn’t meet the expectations of how my Narc wanted this to go (for her). She was angry that she didn’t get to come straight to the hospital and meet my daughter. Let’s just ignore the fact, that I myself STILL hadn’t had the chance yet to meet my OWN, sick daughter. During the hardest week of my life, while my first born child was in special care, my Narc turned my family of origin agaist me. Sadly, many years ago, a member of my family lost their child a few days after birth. The parents wished they had the opportunity for family to have met him. Unfathomably, my Narc used this to guilt trip me with and manipulate my family against me. She used this devastation within my family (along with other’s infertility etc.) as ammunition to destroy me. She also needed to go to these lengths to avoid being caught out for her disgustingly abusive behaviour that occured during that week. So as a young, broken woman, when I needed support more than ever, I was judged and alienated “for how poorly I managed” that situation. The saving grace? My wonderful husband and mother in law (MIL). Thankfully, the family I married are so supportive, that I haven’t lost everyone. The downside for them is that because they have sided with me, my Narc (succesfully) started a smear campaign against them. When my MIL stood up for me and her son, my Narc twisted my MIL’s (justified) reaction as abuse. We would all rather have our reputation shattered than have to be involved with this Narc. This has all occured in the last few months (my baby is not even 4 months old yet). During this time, I found out that my gaurdian (supposed saviour) was my Narc. My reailty has been shifted once again. When I thought my life was all a lie before, well THAT was the lie. Another bonus is that I have finally got to reconnect with ny biological mum. I believe everything that she’s been trying to say for several decades now. While I can’t make up for her sad and unfair past, at least I can give her a hopeful future. She gets her daughter back in her life, she gets to be believed and she gets to be a grandmother. So here I am now, ZERO contact with my Narc since her being exposed. I’m about to face Christmas which will be the first time our paths have crossed in months (I’m nervous). I am on the slow road to recovery. I see a psychiatrist, psychologist, doctor and I am on medication. My focus in therapy is no longer; childhood abuse and associated truama (flashbacks), self-harm and sucidual tendicies, panic attacks or being a first time mum. My focus in theray is healing from the damage my Narc has done to me. I am a shell of who I was but I will heal. If not for me, for my daughter. Sorry this is such a long story, but it’s the only place I feel safe to share. To anybody else, it sounds too messed up to be true. The only people that could believe the unimaginable are other Narc survivors. You are very brave to share your story. I hope you continue to enjoy a great relationship with your mum. Lots of love to you from someone also zero contact with narcs in the family.. They make a disfunctional and bitter trio, and they can get on with it. Bless your heart. Your bio mother’s story is similar to what my narc grandmother and mother did with my disabled child. Now that they have both passed away, we have a chance at real relationship. Congratulations on your precious child and the blessing of a new start.